Just because we call something "wildlife" doesn't necessarily mean it lives in the wild. While it's undoubtedly true that towns and cities are set apart from nature, you can still find all kinds of animals in urban environments, ranging from rats and mice to cockroaches and bedbugs, to skunks and even red foxes. Learn about the 10 most common urban animals across the United States and western Europe. Ever since the first mammals evolved 200 million years ago, smaller species have had no problem learning to coexist with larger species — and if tiny, one-ounce shrews managed to live alongside 20-ton dinosaurs, how much threat do you think you pose to the average mouse or rat? The reason so many cities are infested with mice and rats is that these rodents are extremely opportunistic. All they need to survive is a little food, a little warmth, and a tiny amount of shelter to thrive and reproduce (which they do in vast numbers). The most dangerous thing about rats, compared to mice, is that they can be vectors for disease — although there is debate over whether or not they were actually responsible for the Black Death, which decimated the world's urban areas in the 14th and 15th centuries. Often referred to as "rats with wings," pigeons live by the hundreds of thousands in metropolises as far-flung as Mumbai, Venice, and New York City. These birds descend from wild rock doves, which helps to explain their predilection for nesting in abandoned buildings, window air conditioners, and the gutters of houses. Centuries of adaptation to urban habitats have made them excellent scavengers of food. In fact, the single best way to reduce pigeon populations in cities is to secure food waste securely. The next-best is to discourage little old ladies from feeding pigeons in the park! Despite their reputation, pigeons aren't any "dirtier" or more germ-ridden than any other birds. For example, they are not carriers of bird flu, and their highly-functioning immune systems keep them relatively free from disease. There's a widespread urban myth that, if there's ever a global nuclear war, cockroaches will survive and inherit the earth. That isn't quite true. A roach is just as susceptible to being evaporated in an H-bomb blast as a cowering human, but the fact is that cockroaches can thrive in many situations that would render other animals extinct. Some species can live for a month without food or an hour without air, and an especially hardy roach can subsist on glue on the back of a postage stamp. The next time you're tempted to squash that cockroach in your sink, bear in mind that these insects have persisted, pretty much unchanged, for the last 300 million years, ever since the Carboniferous period — and deserve some much-earned respect! Of all the urban animals on this list, raccoons may be the most deserving of their bad reputation. These mammals are known carriers of rabies, and their habit of raiding garbage cans, squatting in the attics of occupied houses, and occasionally killing outdoor cats and dogs doesn't exactly endear them even to kind-hearted humans. Part of what makes raccoons so well-adapted to urban habitats is their highly-developed sense of touch. Motivated raccoons can open complex locks after a few tries. When there's food involved, they quickly learn to overcome any obstacles in their way. Raccoons don't make very good pets. As smart as they are, they're unwilling to learn commands, and good luck getting your newly-adopted raccoon to peacefully coexist with your fat tabby. Like mice and rats (see slide #2), squirrels are technically classified as rodents. 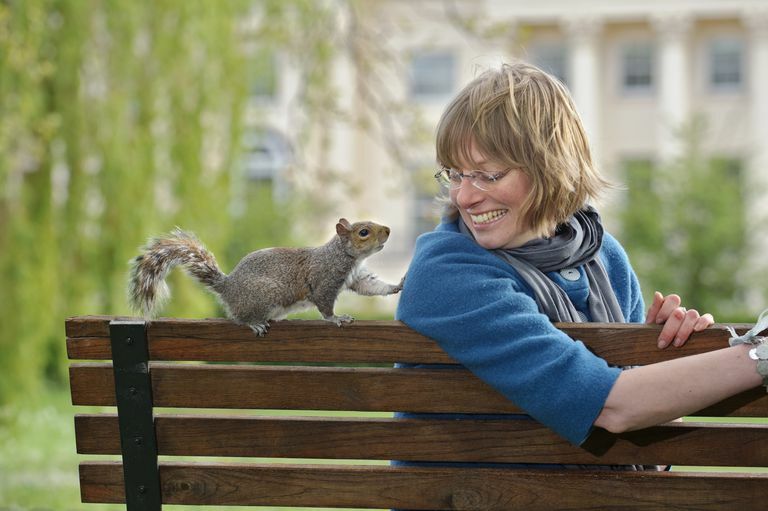 Unlike mice and rats, however, urban squirrels are generally considered to be cute. They eat plants and nuts, rather than scraps of human food, and hence aren't ever found infesting kitchen cabinets or darting across the living-room floor. One little-known fact about squirrels is that these animals didn't migrate of their own accord, in search of food, to cities across the United States. They were deliberately imported into various urban centers in the 19th century in an attempt to re-familiarize city dwellers with nature. For example, the reason there are so many squirrels in New York's Central Park is that a small population was planted there in 1877. This exploded into the hundreds of thousands of individuals that have since spread into all five boroughs. Rabbits are somewhere in between mice and squirrels on the urban nuisance scale. On the positive side, they are undeniably cute. There's a reason so many children's books feature adorable, flop-eared bunnies. On the downside, they have a predilection for the tasty things that grow in yards. This includes not only carrots, but other vegetables, and flowers as well. Most of the wild rabbits that live in urban areas of the U.S. are cottontails, which aren't quite as cute as domesticated rabbits and are often preyed on by free-ranging dogs and cats. if you ever find a rabbit nest with seemingly abandoned young, think twice before bringing them inside. It's possible that their mother is only temporarily away, perhaps out finding food. Also, wild rabbits can be carriers of the infectious disease tularemia, also known as "rabbit fever." Humans have coexisted with bugs since the beginning of civilization, but no single insect (not even lice or mosquitoes) has raised more human hackles than the common bedbug. Increasingly prevalent in U.S. cities from coast to coast, bedbugs live in mattresses, sheets, blankets, and pillows. They feed on human blood, biting their victims at night. As deeply unpleasant as they are, however, bedbugs aren't vectors for disease (unlike ticks or mosquitoes), and their bites don't inflict much physical damage. Even so, one should never underestimate the psychological stress that can be inflicted by a bedbug infestation. Oddly enough, bedbugs have become much more common in urban areas since the 1990s, which may be the unintended consequence of well-meaning legislation against pesticides. Red foxes can be found all across the northern hemisphere, but they're most common in England — which, perhaps, is Nature's way of punishing the British people for centuries of fox hunts. Unlike some of the other animals on this list, you're unlikely to find a red fox in the deep inner city. These carnivores don't especially enjoy massive, close-set buildings or thick, noisy traffic. Foxes are more likely found in the suburbs, where, like raccoons, they scavenge out of garbage cans and occasionally raid chicken coops. There are probably over 10,000 red foxes in London alone. They are most active at dawn and dusk and are often fed and "adopted" by well-meaning residents. While red foxes haven't been entirely domesticated, they don't pose much danger to humans, and will sometimes even allow themselves to be petted. Along with red foxes, urban seagulls are mostly an English phenomenon. Over the last few decades, seagulls have relentlessly migrated from the coastlines to the English interior, where they have taken up residence atop houses and office buildings and learned to scavenge from open garbage cans. By some estimates, in fact, there may now be equal numbers of "urban gulls" and "rural gulls" in the United Kingdom, with the former increasing in population and the latter decreasing in population. As a rule, the two gull communities don't like to mix. In many respects, the seagulls of London are like the raccoons of New York and other U.S. cities: smart, opportunistic, quick to learn, and potentially aggressive to anyone who gets in their way. You know why so many grade-school kids are fascinated by skunks? Because so many grade-school kids have actually seen skunks — not in a zoo, but near their playgrounds, or even in their front yards. While skunks haven't yet penetrated into deep urban areas — imagine if skunks were as numerous in Central Park as pigeons! — they are commonly encountered on the fringes of civilization, especially in the suburbs. You might imagine this is a big problem, but skunks rarely spray humans, and then only if the human acts foolishly. This includes trying to chase the skunk away, for example, or worse, attempting to pet it or pick it up. The good news is that skunks eat less desirable urban animals like mice, moles, and grubs. The bad news is that they can be carriers of rabies, and thus transmit this disease to outdoor pets.